It was another bittersweet round of DT this week, with a little carnage mixed in with some impressive scoring. Overall, it was another high-end week, but did you manage to avoid the landmines and post a huge score? The Bullets has you covered, with everything from last week to next week to the MBR’s – get involved! It was another bittersweet round of DT this week, with a little carnage mixed in with some impressive scoring. Overall, it was another high-end week, with 2200 only just sneaking you into the top 10,000 scores for Round 8. Anything less than 2100 would have had you off the pace this week, and it’s highly likely that some of the better teams had a downer in Round 8. It was very possible that you could have been on the wrong side of injuries to Captain options in Swan (94) and Murphy (27), an early finish to Hargrave (56), and poor scoring from rookies Smedts (19), Greene (50), Ellis (44), Morris (40), Adams (55) and Treloar (57). Like years past, we’re starting to see consistently higher weekly totals due to being in the midst of upgrade season. No longer is a score of 2100 enough to alert the papers, or to earn a spot on your parents’ fridge. It’s getting crowded at the top, but remember; the MBR’s are right around the corner, and they’re the key to keeping your standing while the crowd thins. As a result, the Bullets will be concerned greatly with negotiating the MBR’s and keeping up with the pack over the next few weeks. As much as you might want to be all clever and unique, 92% of coaches don’t have Zorko, and all those coaches need to get him. His JS is high, he’s a DPP, his scoring (whilst he has had only the one full game, and it was against the Giants) is encouraging, and he also happens to be the only promising downgrade option this week. As much as you’d liked to have seen Greene or Shiel grow up to be Angus-quality Cash Cows, it hasn’t turned out that way, thanks to Greene’s suspension and Shiel’s untimely game off. Given that double-trading is the name of the game, someone has to go to make use of all that cash generated by the Zorko downgrade. So with Zorko most likely waltzing into your side this week (sorry to the 8% of coaches that have him already), who do we snap up with all that extra moolah? One of the many contradictions of DT is the concept of fallen premiums. We perk up at the revelation that some DT gun has pumped out a 60 and will suffer a price drop over the next few weeks. We even cross our fingers that they’ll have another bad week soon after so that their price plummets and they’ll become even cheaper yet. Then, when it comes to upgrade time, we look at their recent scores and think…. Crap. I don’t want them anymore. That’s how I feel about Sam Mitchell, Marc Murphy (when he returns fit, of course) and Nick Dal Santo. Take Mitchell for example – he’s been in my side by year’s end for the last few years. He started 2012 really well, averaging 117 in his first four. But then he’s backed that up with 87.8 a game in the four matches since… So while he’s now super cheap, can we really trade someone in on the back of that form drop? This is where your smarts and AFL nous will come into play. It’s what separates the men from the boys – making an educated rationalisation, and turning that knowledge into a smart DT trade, despite what the Assistant Coach’s projections say. Coaches were well rewarded by snapping up Ablett around Round 9 last year when he was severely underpriced, as were the coaches that took a risk and jumped on Broughton after some of his darkest days. Who will you jump on, taking the risk that they’ll return to their glory days? People were talking him up as the new Barlow, but that’s probably an injustice to the great man. I’m thinking Barlow was merely the first Horse! Horsley has averaged 106.75 over his first 4 games, including three tons and a low of 95. Barlow, as legendary as he was, averaged just the 94.8 in his first month of football in comparison. Kyal’s currently smashing every and any Cash Cow record on offer, shooting up another $73.3k to take his total price rise up to $169,300 in just two weeks. Incredibly, he has a BE of -16 heading into Round 9! Gun. He’s quietly become one of the most consistent performers in the AFL right under our noses, has Steele Sidebottom. After two scored in the 80’s to kick off the season, he hasn’t scored below 109 in his last 6 outings. Steele is currently the highest-averaging forward on offer, a clear 5 average points on the next best, teammate Dayne Beams. He’s really come-of-age as an AFL player as well, with his 139 on the weekend probably earning him 3 Brownlow votes for the second match in a row. The new-age DPP forward line is coming on in leaps and bounds, with the 2nd-ranked forward behind Steele in Dangerfield dominating in season 2012. He also had a slowish start to the year but has really taken his DT scoring to another level in the last month, where he averages 117, including two 140+ scores. His 142 on the weekend came courtesy of 35 possessions and 2 goals and despite the Gibbs tag, someone who has had plenty of success in that role in the past. Has Dangermouse finally arrived? He copped plenty of stick for his first-up effort for the year, but Brian Lake has volleyed with some really high-quality DTing. He executed his signature playing style perfectly on the weekend, notching 21 kicks (and just the three handballs) and 9 marks for 106. That’s three tons on the trot for the former, and possibly future, premium backman. The Big O gave hordes of coaches just that on Thursday evening, when he was named to play his 3rd game for the year at a really crucial time. With McIntosh’s injury crippling those coaches who boast him as the centrepiece of their 1-3 ruck structure, Stephenson well and truly arrived to save the day. 77 points isn’t a huge score, but its exactly 77 more than those coaches would’ve scored without using a precious trade. Marc Murphy has been a much traded-in player in recent weeks, especially sideways from Ablett’s knee injury and more recently as an upgrade target. It really has proven to be a disaster trade, as he’s scored 117, 94 and 68 since Ablett went down. And to top it off, he made it to just 27 before leaving the field with a shoulder injury. In summary, that’s a 76.5 point average since Round 4, a $107,700 price drop and a forecast 3-4 weeks on the sidelines. Ouch. Carlton was completely outgunned on the weekend, and their fantasy scoring reflected it. Onca again, Gibbs was well below par. It feels like he has been down for a while, but until you have a close look at his scores you can’t comprehend the horror of the season that’s he’s having. His 53 in Round 8 took his five-round average to 78.2, including zero 100+ scores in that time. He wouldn’t even be getting a gig in our backlines with those putrid numbers. Mitchy Robinson was rumoured to be a possible late exclusion this week, and I almost wish he was. Whether he was sore from that well-publicised knock last week or he was just another victim of the Crows’ dominance, I don’t know, but 53 points isn’t up to his usual standard. It is especially frustrating for the coaches that had Zorko’s 96 glaring at them from the bench. Thankfully, this is the only blemish from a great season from Robbo. It’s a little harsh to slide Toby Greene in here, but in the big scheme of things, the 50 he scored on the weekend is super disappointing. Yes, the Giants got smashed by the Lions. But Greene showed us two weeks earlier with a 122 against the Blues in a 67-point thrashing that he doesn’t rely on team success to produce a decent score. Yes, as a rookie, we need to expect his scoring to be volatile and inconsistent. I’m more thinking about his prowess as a Cash Cow, and how this 50 has shut the brakes completely on his impressive cash generation, and will continue to do so while it muddies his three-week rolling average. Oh, and he’s also suspended for one match. Thanks for the memories, Tobes. You thought it was good news, Billie Smedts coming in as a late replacement for the hobbled Scarlett? Oh, he didn’t get the sub vest? ‘Beauty’, you thought? Many coaches slid him onto the field for Ellis/Morris on the back of this pre-lockout tid-bit, but were burnt by Smedts’ 19 points before a subsequent red vest. There goes his rejuvenated cash-making potential. Prior to the season, I wrote an article on Fixture Theory and what it means for DT. But that was before we had any data, back when we had no idea that Melbourne was going to be the new Port, and we assumed that Collingwood was going to eat their opposition alive. 8 weeks in, we’re all the wiser, and we have the data to prove it. Over the season, I’ve been recording every point and every ton to track the scoring trends of each team. 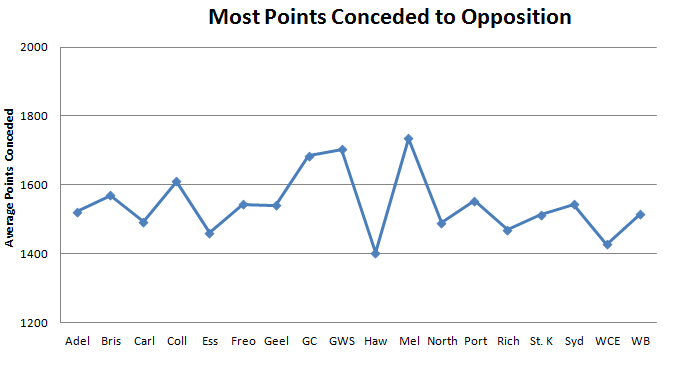 Eight weeks in, we now have a good idea of which teams will surrender the most points to the opposition. Below is a graph showing which teams’ playing styles result in more points, for both them and their opposition. 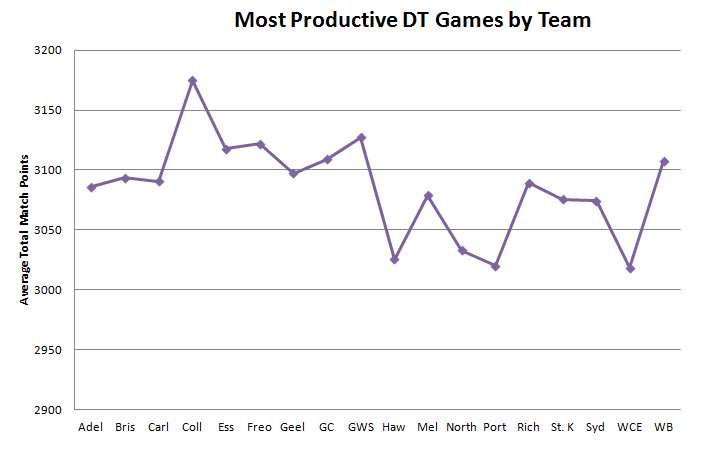 As you can see, teams like West Coast, Port and Hawthorn take part in DT-stingy games, while surprisingly, Collingwood plays in the most DT-friendly matches. Easily the most relevant stat has to be which teams concede the most points to their opposition. The whole reason why we consider the draw is to get a reasonable idea of what we can expect a player to score against a certain team each week (weekly Captain selections, for example, – or the difficulty of a player’s upcoming fixture), so it makes sense to pay the most attention to how many points certain teams allow their opposition. As you’d expect, the three minnows (Melbourne, GWS and Gold Coast) are without a doubt the easiest teams to score against. I was particularly interested to see the Pies up there as well, given how as a DT collective we intuitively shy away from selecting Captains who take on Collingwood. At the other end of the spectrum, it’s no surprise to see the Hawks and Eagles restricting opposition scoring, but it’s interesting to see Essendon and Richmond, two of the bigger improvers this year, in the same bracket. I don’t want to bore you with stats, so I’ve included two excel files for those interested enough to check out the new values and implications. The first (DT SCORING 2012) is a collection of each teams’ DT data to date, while the second (fixture study – new values) is the updated fixture study. Enjoy! That’s a very interesting point. Immediately I was completely pro-Gibbs trade, but let’s break this down a little. He’s priced at $406,900, having already dropped a huge $122k this year. He’s averaging over 20 points less than he did in 2011, and if he scored his average (85) for the remainder of the year, he’d bottom out at around $380k. That’s just $25k less than what he’s priced out now. I think that with Murphy out, it’s acceptable to risk that $25k price drop in the hope that he’ll increase his scoring in the next few weeks. I mean, given what he’s cost you already, things can’t really get any worse. If you can save a trade and $100k or more (what it would cost to ‘upgrade’ him), then it’s a great call. I’m not sure about top 3, but he’s definitely lifting his game in the DT stakes this year. 7-straight tons and ranked 7th on overall points is a huge jump in scoring from him than in years past. It’s safe to say that he’s found his niche, streaming through the middle and setting up play off a half-forward flank. But the interesting thing you point out there is that he won’t be a DPP next year, and you’re completely right. Like other premium defenders before him in Gibbs and Hodge, we will have to experience life without Deledio down back in 2013. Who else will lose their DPP next year? From what I’ve seen so far, neither Goddard, Scotland nor Carrazzo have undergone significant positional changes this season, so they should be safe. What about up forward? We’ve had an explosion of the next-generation DPP’s there this year, but will they all keep it for next season? Beams, Zaharakis, Martin and Robinson all seem to be playing similar roles as last year, while Chapman will be a DPP until the day he dies. The ones that have me worried are Sidebottom and Dangerfield. Both are playing significantly more through the middle, and are scoring much more freely and consistently as a result (both have increased their average by at least 23 points from last season). It will be an interesting wait to find out whether these guys go the way of many before them, and into near-obscurity as pure DT midfielders. I’ve been thinking about this a lot, as I also have Hall taking up space in my forward line. Obviously, it depends a lot on who else you have in there. In my case, I have Kennedy and I’m opting to get rid of him instead at this stage. Kennedy is injured, has basically topped out as a Cash Cow and will give me more money to play with. Hall to Zorko gives me only $40k less, but he still has plenty more scope to grow if he can crack another game. To answer your question, I fully expect Hall to play again this year. When, is the big question. He was named in the Reserves best this week despite not kicking a goal, which has to be good news. It’s a really hard call to make on this dilemma without a crystal ball, as it could easily go either way. # Richmond plays Hawthorn on Saturday, which has two of the most restrictive teams going head-to-head. These teams have given up the first and fourth least amount of DT points to their opposition so far this year. # The Giants play Essendon this week, which has me seriously scared. Essendon is the highest-scoring DT side this year, while GWS concedes the 2nd-most amount of points to their opposition after Melbourne. Stanton for 200? # West Coast play Fremantle in the Western Derby. Regardless of where teams are on the ladder, this generally results in an arm wrestle twice a year. Intuitively, we know this is not great for DT, so temper your expectations for your Dockers and Eagles accordingly. 1) Congratulations to my mate Maddog, coach of jimmy’s giants, who topped this weekly scoring this round with a huge 2476 points! Enjoy the $500 and Corporate Box experience! 2) Well done to my troops in the DT TALK Tbetta League, as we’re now back inside the Top 20 leagues at 19th! Close to call but Watson because it suits your bye structure. Oh my bad, both suit your bye structure. Tough one to call. got 215.000 odd in the bank and have murphy. need to upgrade ellis aswell. thinking of 2 uniques with jack grimes and murphy for scott selwood whos been up and form and can easily score 130′s. Is this is a good move and I need my Rankings to jump higher…. what should i do? I noticed a lot of people are trading in Swanny for Ablett. Would anyone agree that Pendlebury would be a better and more consistent choice, Ablett has been a bit flat lately. or will ablett come back to his best soon?? Umm… Why? It just means he’ll get more attention and number 1 tagger will go to him every week. Scores wont change much and if they do, they’ll most likely be worse. Pendles will struggle to score 50 against the crows this week. Van Berlo will blanket him. stanton, watson, thompson or j.selwood?? Does this sound totally stupid or is it something that has to be done? I DO NOT trade in Zorko because I need to trade both Swan & Murphy traded to premiums because with Greene out with suspension I will get a doughnut in the mids. Ahem, perhaps Greene to Zorko? Well then which one out of Swan/Murphy to Pendles/Ablett? Assume you already have stanton or can’t afford him. Murphy (more unpredictable injury that could be out for longer) to ablett. But again, assuming you don’t have Stanton. Ahhh my boy, that’s where Watson comes in. He will always get the number 1 tag Stanton makes seagulls look like doves. Murphy…….he will miss more games. Both. Just which one first. Check bombers draw and compare his opponents to tbetta’s charts above. On downgrades, just hope neeld reads rlgriffins letter and plays couch. Great article! Ive got a little issue with Mcintosh if he is ruled out again this week should I be going to look elsewhere or stick with him? Just to add I’m in the top 1500 and do have Big O. But after seeing how easily macs knee went and with Goldstein hitting a bit of form is it still worth keeping Mac? Cheers. Two comments, no reply. Cause you are a dunce. Stop wasting everyones time with your insignificant comments. Thanks mate, you were a significant help. Your Info was so good you have probably just made me the front runner for the car. Cheers. People come to this site to ask for opinions. What did he do wrong? People like you should be banned. By the way, nice name. Pdiddy ….. I think you have mixed up the forums. This is a site for afl dreamteam fans. Please explore the internet further until you find the ” white boys wants to be a rapper” sites. I got Watson last week, but if I had to make the same choice this week it would be jelwood. Watson does have a history of injury but jelwood has suspension and concussion issues. Selwood has a low BE this week so will surely go up in price next week. But at the end of the day they are both guns. He also has the round 11 bye, Thompson for a round 12 upgrade? Perhaps Rocky for FWD/MID ;) ? Stanton. Stanton. Stanton. He fights seagulls at the beach for left over chips! McDonald has been great but should I trade him if he’s not named this week? Greene is out this week with suspension so he is another option (B/E of 85 as well). Hall is a dead weight on my forward bench but how do people rate his chances of a getting a game in the next 4 weeks? Shiel’s very close to peaking in price. While I agree about Collingwood not wanting to risk Swan against the Dees, Rocket said on AFL360 that because the Melbourne game is on a Monday and that the fact they do have the bye after melbourne, they WILL play him if he’s fit, because they don’t want him to miss more footy than he needs to and want to keep him sharp. Obviously won’t risk him if not 100%, but every chance to play Melbourne. Tough decision! Keep in mind Stanton does have GWS and Melbourne the next 2 weeks and Ablett is Ablett. What ever suits your bye structure! whatever one suits your bye structure more. Looking at your team definitely get in Beams. Your mids are strong enough if McDonald plays, but your forwards depth is shallow. Murf – Zorko and Kennedy to Beams. grigg pumping out some huge number and pav ready to explode???? I like Grigg he has been playing well. Not sure on PAV though mate..
Open to suggestions. Not fussed about the bye rounds just gonna take them as loses and if I win it’s a bonus. Any feed back would be awesome. You should have had Delidio from day 1, always MID/DEF lock. Keep Hargrave, trade Clarke if you have to. Porp (F6/7) to Danger (F1-3) is not an “upgrade” per se…”cash cow” to Danger is what you want. 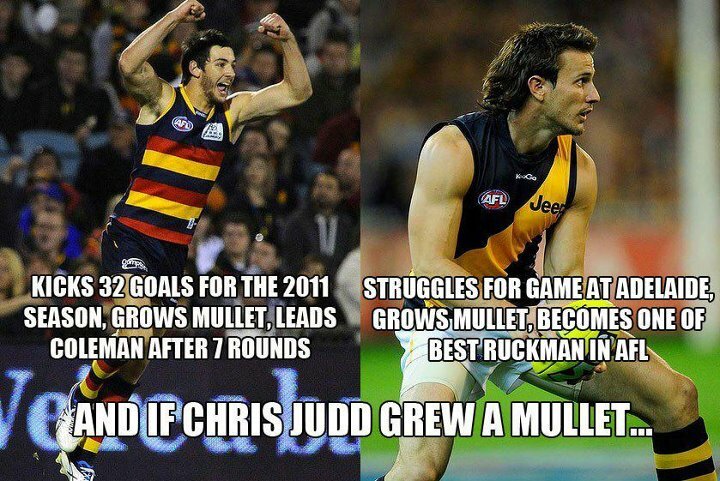 It’s my second year and not getting deledio from the start is definately a rookie mistake. May have enough to upgrade one of my GWS guys instead. These leaves me off the Zorko train, but I feel like those two have such low BE’s its too big of a risk to let them pass. Instead of trading Ellis, do I trade Bartel and get Stanton?